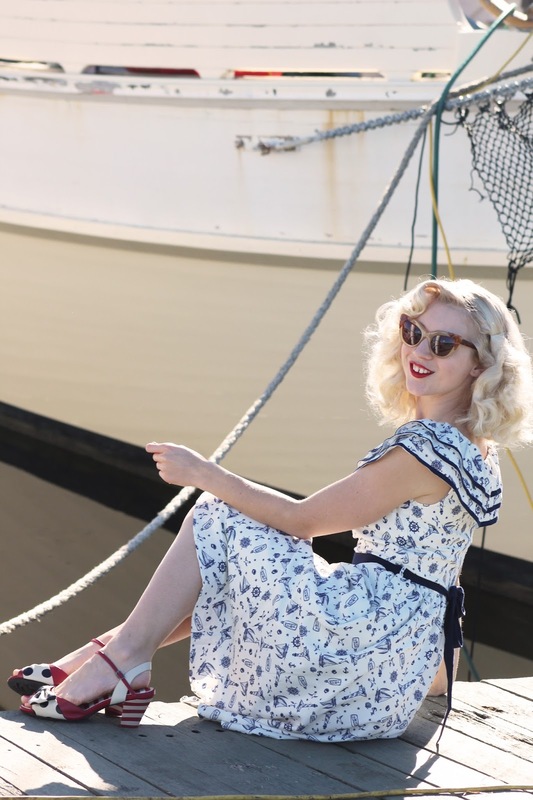 Wearing a nautical dress with the sweetest details and paired with the cutest shoes - you bet that I wore this outfit by the water! I wore this outfit to the waterfront last week for a walk, I didn't think I would get any decent photos because it was so bright but luckily this beautiful yacht that I always admire provided some great lighting. I assume they were out or maybe sleeping as I was prancing around in front of it, so it's good that they didn't see me doing so in front of their home! It was a warm day and the jacket I paired it with was only on for 5 or 10 minutes once I got walking (and prancing). 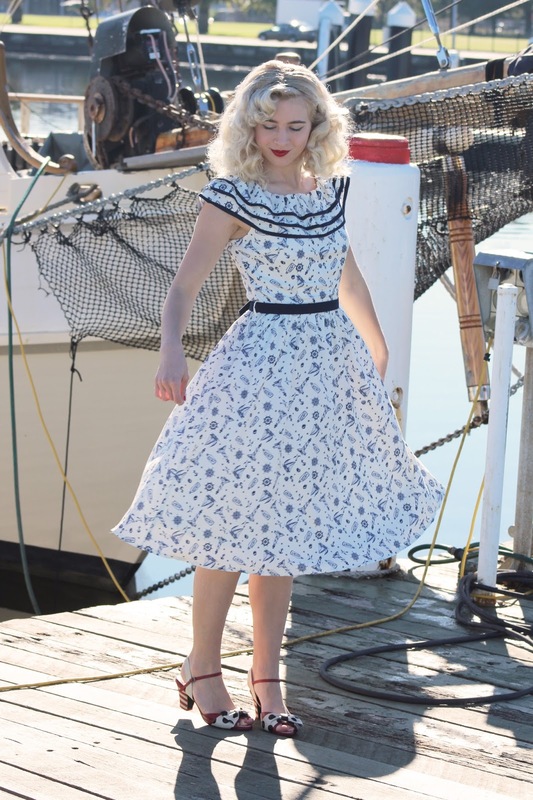 Voodoo Vixen always releases a great range of nautical themed clothing and the beautiful collar on this dress caught my attention when I first saw the S/S Lookbook. The quality of their garments is always top notch and they seem to get better and better with each collection. 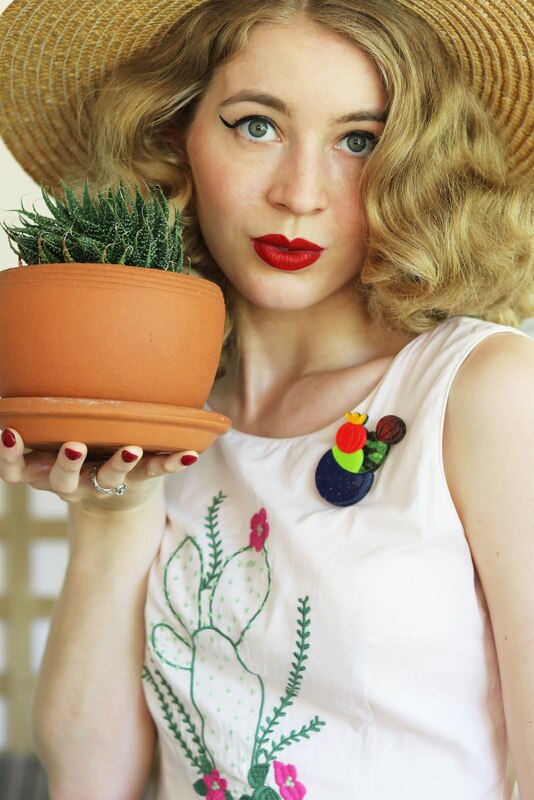 I can see myself styling this dress 1940s or even 1930s style too. This particular day my hair had a mind of it's own so I let it do it's own thing after a quick comb, styling of the fringe and some hairspray I was ready to go. I love the nautical print on this dress and am really looking forward to getting lots of wear out of it during spring and summer, but for now I will team it with a cardigan or jacket for cold days. Shoe Fun is an Australian store that stocks some amazing shoe brands with a wide variety of styles. 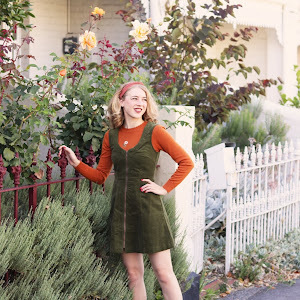 It can be difficult ordering shoes when I am unsure of the sizing, especially brands that I am unfamiliar with so it is exciting to have found a store that has lots to choose from and offers great insight on sizing. There is quite a bit going on with this outfit - from the print of the dress and the stripes + polka-dots of the shoes but I love the pop of colour and I don't think they clash it all... Sometimes we have to take a fashion risk don't we!? Such a pretty dress! Classic nautical style at its best! Those shoes are fantastic and so cute with that dress! I also love the jacket that you paired with it! Such a gorgeous look! The dress goes so well with those amazing shoes. Super charming outfit! 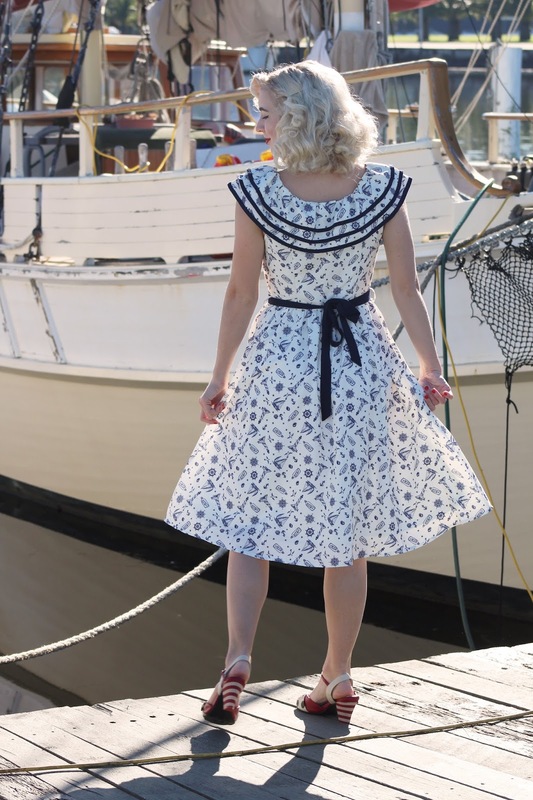 I just love that there are even tiny message-in-a-bottles amongst this lovely dress' delightful nautical imagery. How darling is that? !